Have you ever had those evenings after a long day where you were just sitting in the bath tub, and had a sudden urge for some spicy curry? Yep, we all have. Well now Bandai has come to our rescue. They have created Curry Bath Powder in 4 delicious flavors: sweet, hot, very hot, and white stew. 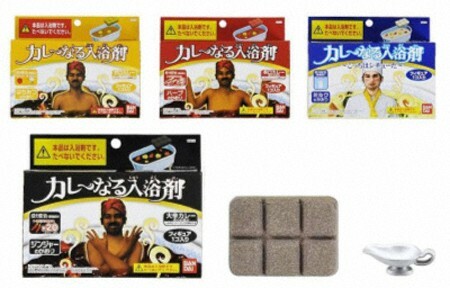 These bath powders will turn your bath water the color of your desired curry. They even come packaged like the curry cubes you would use in a curry base. I know some of you are thinking, “WTF.” Well, it’s not as weird as it sounds… even though it kind of is. Bandai’s curry bath powders use the more bath appropriate ingrediants in curry like honey, milk, and ginger. So those of you that like milk baths, will probably get a kick out of this as well.